Going to be blunt right from the start: This was a much better year than 2017. This year has been actually full of pleasent surprises because one might have thought that the end of the Rebirth initiave could bring down the quality of the DC line as a whole and, while that is true in certain aspects, DC Comics is still stronger than ever nonetheless. Yes, despite of how many terrible books I was able to find in 2018, I'm happy to announce that the sheer amount of great titles was simply staggering and there's a good reason for that. This year saw the beginning of many exciting series that quickly delivered on their promise and potential, and in many cases they even surprised me. In fact. there are so many great titles this year that I almost regret that I'm letting quite a few books that I love out of the list simply because the ones that are in are either more important to mention, fulfill the usual requirements or are simply better. This is a damn shame because I could mention Gail Simone's surprisingly funny Plastic Man series, Peter Tomasi's immensely enjoyable Super Sons work, Dan Abnett's and Robert Venditti's satisfying conclusions to their Aquaman and Green Lantern runs respectively, among others but alas, this is not their time unfortunately. 10. Justin Jordan's The Curse of Brimstone. What a better way to start this list than with a book from a line that I criticized so much? As I mentioned before, the Dark Matter line produced a few atrocious books because of their less than ideal creative teams, even some of the titles that couldn't be considered "bad" per se, still failed to live up to their potential as seen with The Silencer. Nonetheless, there were quite a few gems and one of them was one of the most unexpected. 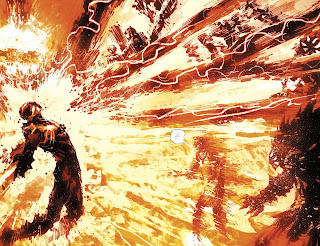 The Curse of Brimstone is not a conventional DC book. In fact, its ties to the Metal event and even the DCU as a whole are very little and quite frankly, that works for the better. This allows Justin Jordan to create a story that seems like actually happens in its own world without the unnecessary interference of superheroes to mess-up its progress and this is especially important because of the tone of the plot. This series is one that you don't usually see on the stands anymore: A horror book, and is pure horror all right. The story is centered around Joe and his family who were forced to deal with a mysterious pact that doomed their future. 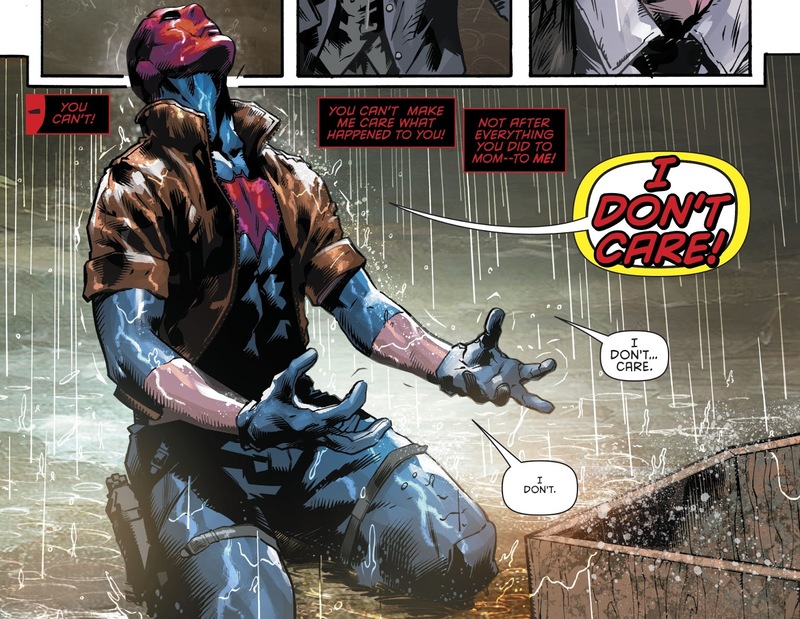 Every issue focuses on a different and terrifying event that puts the protagonists in danger and just when you think that their lives can get any worse, they do. The tension is palpable in every chapter and their hope continues to fade away every time. This is emphasized in each town they visit due that every new place they find apparently made a similar pact as they did which forces them to face horrific creatures that at some point were human, each one of them with their own stories. The universe of The Curse of Brimstone is quite deep, compelling and barely even references other DC mythos. As I said before, it's pretty much a standalone tale that doesn't require you to know anything about what happened before or what's currently happening in other DC titles, it almost feels like a pure indie series or an even like a book from the classic Vertigo line. Is necessary to mention that while the Dark Matter line was heavily advertised as a huge contribution between artists and writers, the strength of this story mostly falls into the writer's hands. Yes, the artists who work here capture the supernatural visuals nicely but really, Jordan's script is what makes the title shine. Showing a great level of uniqueness is what automatically made The Curse of Brimstone an instant favorite. Remember when I said last year that: "This title wasn't as good as last year"? Well, the trend is being repeated here. And understandably so. Christopher Priest's beginning on Deathstroke was immensely strong, it immediately became one of the best books in the entire DC line and one of the shiniest examples of what the Rebirth initiative could bring. Sadly, things started to get repetitive after a while. Many of the themes that Priest touched during his first year are continually brought back to the point where it almost seems like this run can't offer much new at this stage. So, why is this still on the list? Because what it offers is still pretty solid. Even though there's already a sense of repetition in this story, Priest still manages to create a great character study of Deathstroke, his family and how his screwed sense of morals can affect everyone around him. 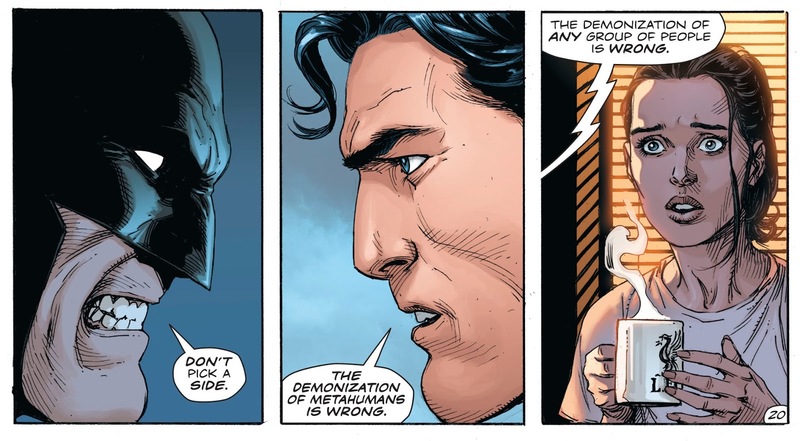 One of the best stories of this year was without a doubt the "Deathstroke Vs. Batman" arc that finally put the World's Greatest Mercenary against the World's Greatest Detective. This is a conflict that has been building up for a while in this same book and Priest delivered in every front by creating powerful parallels between Slade and Bruce not only concerning their abilities but also their parenting and how their loved ones react different to each one of them. 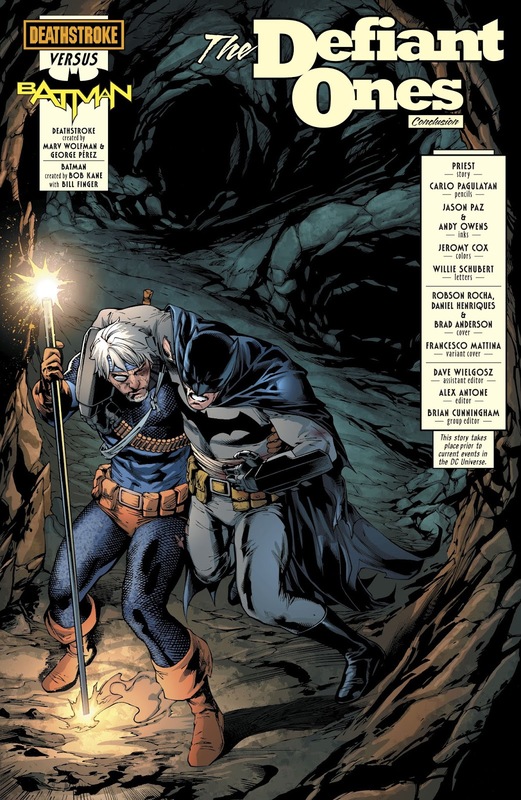 Even some of the recent storylines offer good moments like the fact that Slade is now in Arkham Asylum and has to fight for his life and sanity. Unfortunately, this is where many of the familiar ideas that we have seen so far appear once again but while the novelty is lost, the execution still allows for a good experience. Not as impressive but still manages to be one of the books of the year so that is impressive by itself. 8. Scott Lobdell's Red Hood & the Outlaws. Who could have known that this would still be on this list? Scott Lobdell is not exactly known for being a consistent writer. In fact, his reputation usually puts him among the "hit and miss" category so you never know what kind of Lobdell you're going to get. That being said, the Rebirth version of Red Hood & the Outlaws has been a constant winner since the start and three years in a row now, proves to be one of the strongest titles on the stands. The story in 2018 has been mostly devoted to the fall of Jason Todd where after learning the fate of his father, decides to take revenge and that makes everything escalate immediately from his inevitable conflict with Batman to the apparent death of his friends, Jason keeps losing his loved ones one by one and Lobdell is smart enough to create a complex situation where basically everyone is at fault. The writer even delivers a bittersweet dream sequence of how things could have been where the old and new Outlaws are reunited and work together, finally bringing happiness to the protagonists which contrasts perfectly to the tragic events that are happening. Best of all is that Lobdell gets something positive from all of this, even from a terrible editorial mandate like the death of Roy Harper, Jason's close friend, since Lobdell was the one who created a send-off story for Roy and plays with the ramifications of such event, leading to the isolation of Jason from everyone and his search for a new direction in his life. 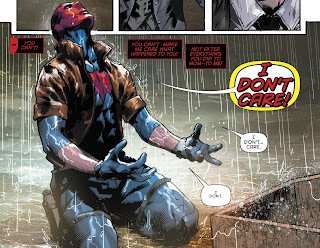 Still strong, still surprising, Red Hood & the Outlaws has been nothing short of a miracle. 7. Jeff Lemire's The Terrifics. And here is another proof of what the Dark Matter line was able to offer. My love for Jeff Lemire is pretty obvious, I have been a fan of his since his early work at DC which topped during his already legendary Green Arrow run. Unfortunately, his Green Arrow work would also be his last DC work for a while due that he left for Marvel in the following few years which, let's just say that didn't lead to the best era of the Emerald Archer. Fortunately though, Lemire finally returned in 2018 to work on a concept that funnily enough, Marvel wasn't willing to invest at the time: A Fantastic Four-like series. 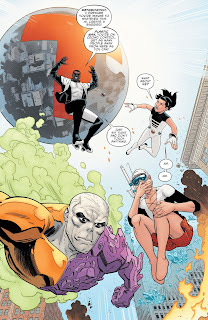 Yes, the premise of The Terrifics is pretty much centered around the adventures of a group of misfits who find themselves forced to stay together and you better believe that Lemire was going to exploit that premise to the max. Using mostly ignored DC characters like Mister Terrific, Metamorpho, Plastic Man and Phantom Girl to work as analogues of Marvel's first family, the author delivered one of the most solid team books in a while. Mind you, the beginning of the book wasn't exactly what you would call "great", it was decent enough since it quickly explained why these heroes are brought together and their direction was immediately cemented but the first couple of issues were definitely slow at delivering the proper content it promised. However, the book rapidly found its footing and delivered a constantly entertaining sci-fi journey where the group would continually find Silver Age-inspired concepts, from galactic threats, to Multiverse scenarios, to crazy creatures and even following the Fantactic Four elements, they even have their own Doctor Doom! Lemire didn't even forget the classic "family" aspect that a story like this requires and makes all these characters start growing fond each other almost instantly while creating an engaging chemistry that makes you buy that this team can work appropriately together. I would say that this is another case where the strength of the book falls into the writer's hands but one have to recognize the talented pencillers who have worked here like Doc Shaner, Joe Bennett and Viktor Bogdanovic, all of them reflecting perfectly the enjoyable script. Both solidly told and drawn, The Terrifics is always welcomed in any best list. 6. Scott Snyder/Aaron Gillespie/Andy Kubert's New Challengers. 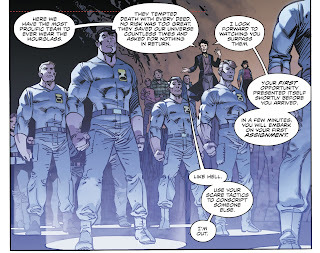 While The Terrifics was a good proof about the quality of the Dark Matter line, New Challengers perfectly showcased its potential as a whole. This series succeeded where others from the same line failed: Creating new interesting characters and an appropriate story for them. The Immortal Men and The Unexpected wasted too much time in both exposition and action instead of trying to make their recently created casts compelling, New Challengers fixes these mistakes by giving each protagonist their own chapter where their past and motivations are perfectly explained which makes their role in the story and world much more intriguing. That's far from the most positive aspect since Snyder demonstrated his skills at worldbuilding by creating a deep and complex mythology behind the obscure Challengers of the Unknown which was connected to the recent Metal event and reveals a big history for the team and their different incarnations even allowing for the classic version of the adventurers to play an important role in the story. The most impressive thing about all this is that this was just a 6 issue miniseries which is far less than other less than impressive titles from the same line got and this series still managed to beat all of them for its sheer amount of quality. Even some of the typical Snyder flaws weren't present here like the usual overexposition that plagues most of his works and I could be wrong here, but I think that Aaron Gillespie might have played a big factor at creating more natural and appealing dialogue. Of course, is necessary to mention Andy Kubert's pencils which contributed a lot to the script in terms of expressions, detail and storytelling which makes this book the perfect example of what the Dark Matter line should have been, a good balance between great art and writing. Nothing more to say that I wish more books that came after Metal would have been as good as this one. 5. Joshua Williamson's The Flash. This is pretty much Christopher Priest's Deathstroke in reverse, getting stronger each year. Remember when last year I mentioned how the best part of the book were the reintroduction of The Flash's villains especially The Reverse-Flash? Well, this year the title played with the ramifications of such events with Barry dealing with all the threats that have been putting him and his loved ones in danger and being forced to alienate himself from the rest, even his long-time love interest Iris, creating a great character work for everyone involved here. This eventually leads to the return of an old friend and other old enemies which culminates in one of the biggest events in any series this year. "Flash War" was the biggest story that this title had up to this point and Williamson delivered on its premise and more, bringing back fan-favorite villain Hunter Zolomon/Zoom to the post-Flashpoint continuity and deciding to finally put the debate of "Who is faster? Barry Allen or Wally West?" 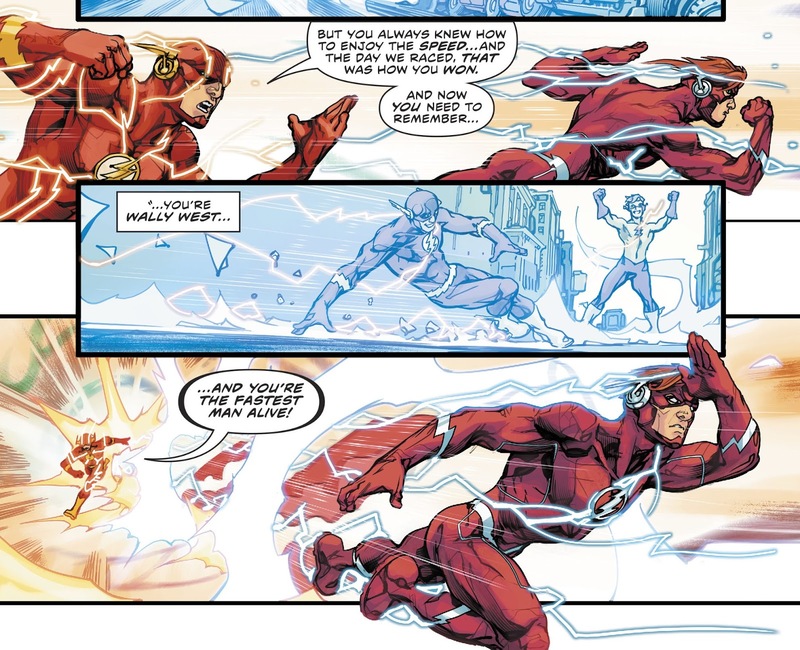 to rest by giving a pretty satisfying answer that made the often ignored fans of the Wally West era of The Flash happy and also motivating Barry to become better in the future. And things are not even over for the writer since he's exploring the recent developments in the pages of Justice League and introduces concepts like the different Forces aside from the classic Speed Force and at the same time, revives a few other forgotten Flash mythos in logical manners. Logical, strong, consistent and satisfying, every new installment of this run proves to be a worthy read. 4. 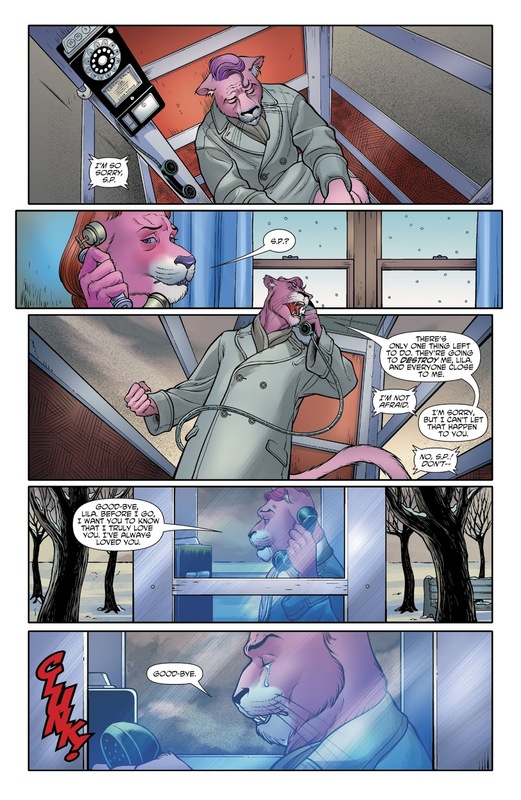 Mark Russell/Mike Feehan's The Snagglepuss Chronicles. Here is someone that you should expect in these lists at this point. Mark Russell has quickly become one of the most acclaimed writers at DC's roster. From his, let's say, interesting beginning in Prez to the perfection of all his ideas in The Flintstones, Russell has demonstrated time after time that he can deliver an impressive work consistently and you better believe that The Snagglepuss Chronicles is no different. Leaving aside his satirical writing, Russell tells an emotional and human story focusing on a bunch of anthromorphic animals (Yes, you heard it right). 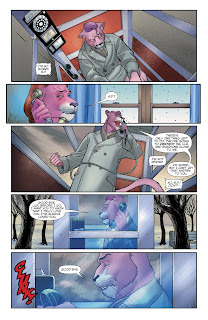 Despite of his comedic roots and the weird premise, the writer managed to create a compelling tale suited during the Cold War that is centered around the life of the classic Hanna Barbera character Snagglepuss and how he has to deal with a time and career that won't approve his sexual orientation. Yes, sexuality plays a huge part of this story and Russell explores how bigotry, especially during that era, affected people who loved people from their same gender. The way how the different themes concerning homosexuality, war, government and politics as a whole come together is pretty realistic and touching up to the point that it could be relevant in even this day and age making others questioning the way how they treat people because of their differences. This is the kind of book that we need, the one that can influence others to be better simply by evoking a sense of compassion from them. Fans of Hanna Barbera cartoons might be a bit at odds with the different interpretations of these beloved characters at first but Russell knows how to implement their histories in a way that is kinda logical and brings such a huge amount of heart that could make anyone care for all these people anyway. Mike Feehan contributed a lot of the quality of this book due that he managed to make a perfect mix between the human and animalistic characters in a manner that you could perfectly see them coexist in the same universe, all of them with great detail and expressions reflecting the moments. To be honest, I don't think this book is really as good as The Flintstones due to the multiple and wonderful themes that series touched but it doesn't need to be to still be fantastic. Is not the typical title that you would expect from Russell but is still one worth checking out without a doubt. 3. Adam Glass/Bernard Chang's Teen Titans. This pretty much came out of nowhere. 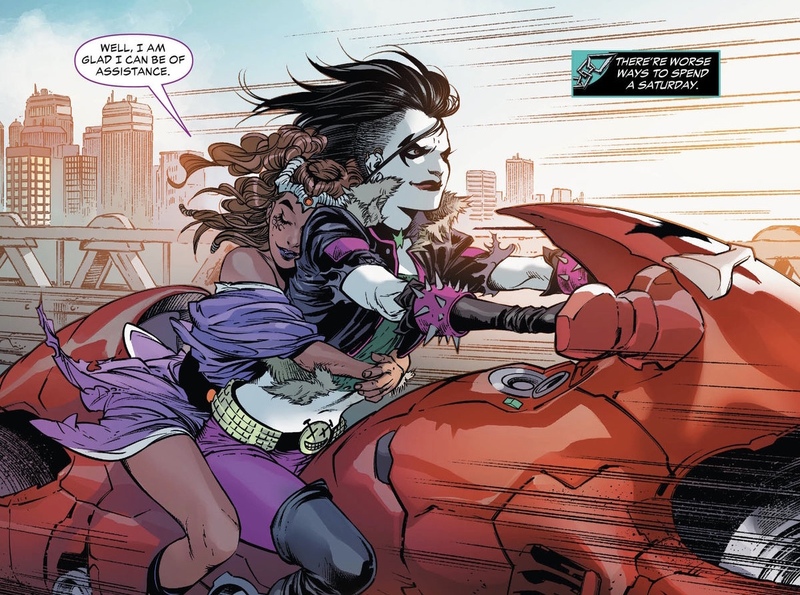 Despite of blatantly disliking Ben Percy's run on Green Arrow, I didn't have many problems with his Teen Titans run since I believe he managed to create stories that were appropriate for the book, characters and tone. That being said, his run still had a rather "conventional" feel, meaning that while there wasn't anything bad about it, there was nothing particularly impressive either (although the fact that I didn't hate it might have been impressive on its own). It was pretty much a safe work through and through. And let's just say that I wasn't that excited about Adam Glass' arrival to the book either. Glass is a pretty hit and miss writer, if there's a word to describe his work it would be "edgy" which means that he usually uses shock value and impactful moments mostly centered around violence to gain attention of readers and this is not necessarily bad per se, sometimes it can work like in his New 52 Suicide Squad run but other times it can miserably fail like his atrocious Flashpoint: Legion of Doom miniseries. However, while his run certainly started "edgy" enough, it quickly grew into something more, something that this series has been missing for a long time. Despite of being a book about teenage superheroes, the Teen Titans rarely had an energetic feel to it. Scott Lobdell kinda had it but we all know how execution and editorial got in the way and following creators didn't do a much better job. Glass on the other hand, understands that a book about young characters should be exciting, funny and especially fun. Giving the team a brand new direction, the title quickly delivers engaging adventure after engaging adventure focusing on classic characters and most important than all, newcomers. Glass introduces three different protagonists in the form of Crush, Djinn and Roundhouse and, unlike previous failed attempts, they prove to be immediately endearing, interesting and likable, perfectly fitting into the young tone of the story and producing great chemistry with the rest of the cast. This is exactly what the series needed and something that strangely hasn't done pretty much since the Marv Wolfman and George Perez' era of the Teen Titans, introducing new blood and making them immediately compelling. Bernard Chang's pencils provide a lot of what makes this series so good, the vibrant touches, storytelling and detail are all perfect for the script and route that Glass offers. It might be too soon to call this one of the best books of the year? Especially this high? Maybe but I just can't help but love the title right now and highly anticipate every issue. (Oh, yeah, and it also created one of my new favorite ships as you might have already noticed). 2. Tom King/Mitch Gerads' Mister Miracle. Surprise, surprise, I don't hate Tom King. I have been one of the people who have criticized his work pretty much since the beginning because of the annoying ticks that are constantly present in his books like the unnecessary adhrence to his themes to the point that he's willing to completely rewrite characters just so they can fit and thus, doesn't create satisfying experiences for fans. That being said, whenever King works on obscure characters that don't really have many defining stories, he tends to shine due that nobody will ever complaint about them being out of character and can even interprete them for a new generation. I would have said that if the protagonists of Mister Miracle would have been off but shockingly enough, that's not the case here and for once, King understands what makes these characters and concepts so compelling and important, and simply expands on it. The New Gods are not ideas that are easy to handle, it has been demonstrated time after time that even the slightlest alteration to their direction, style and themes can be considered blasphemous but, while I don't think quite nailed their interpretation here, I don't think he really needed to since the plot is mostly devoted to the human side of these deities. The story is primarely centered around Scott Free's recently-found struggles concerning his life and how he wants to escape in any way possible. In fact, one of the recurring aspects of this title is how it handles Scott's depression and the way how it's reflected in the esoteric events that happen around him which are accentuated once that Highfather dies and he's forced to take a more important role in the war of the New Gods. Nonetheless, despite of how important the war against Apokolips and Darkseid is, it mostly serves as a background to the true focus of the story which is how Scott is trying to regain a direction for his life along with his wife Big Barda and his recently born child, Jake. 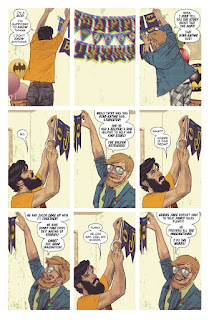 The reason why this works so well for me compared to other works written by Tom King is because he actually leaves his pompous style aside for the most part to develop an actual beliavable romance between Scott and Barda, their relationship is powerful, emotional and relatable, and I would say that all the mistakes that King made with the relationship between Batman and Catwoman during his Batman run are corrected here in a way that actually surprises me that both works are written by the same person (and this is especially funny because Scott and Barda are more human here than Bruce and Selina in King's Batman despite that they're not supposed to be). Not only that but King also gives the classic Kirbyesque character, Funky Flashman (a known parody of Stan Lee) a relevant and likable characterization since he serves as the babysitter of Jake and at some points King goes legitimately meta and starts referencing how Funky puts words into Jake's ideas which is a clear reference to the dynamic the two Marvel creators had at one point and considering the tragic recent passing of Stan Lee this year, I think this is an extremely touching way to say goodbye. All of this culminates in the inevitable conflict against Darkseid where all the themes that King has implemented all this time come into play, delivering a bittersweet, yet satisfying conclusion that puts Scott's condition into a perspective where nobody is necessarily right and ends-up becoming really thought-provoking. Also, while the quality of script is pretty good, this series wouldn't be even half as good without Mitch Gerads wonderful pencils, his semi-realistic artstyle manages to capture every expression and detail from the story with great precision, elevating it to a much higher level. Sure, some of the usual problems with King like the pretentious writing (particularly when he handles the topic of God) still surface but as a whole, I have to surrender myself to the huge amount of HEART that Mister Miracle had. And this leads to my final pick: What is the best DC Comic of 2018 for me? Is one based on an idea that I honestly didn't think it was going to work. You see, there has been several attempts to play with this concept and characters in the past which is not something easy to do since they were created by who is usually considered as one of the greatest writers, if not THE greatest, who has worked on the comic industry. For this reason these previous attempts have failed and were almost immediately forgotten even though they were handled by fairly competent creators. So you would understand why people were a bit hesitant after a similar project suddenly surfaced and what made it more worrisome is that it was connected to a writer that, while good, is not what you would usually consider complex. For all intents and purposes this project shouldn't have worked, it should have failed. 1. Geoff Johns/Gary Frank's Doomsday Clock. Just as an opening and to put things in context, does anyone even remember Before Watchmen? You know, that heavily marketed line of books that were supposed to work as a prequel to the legendary series Watchmen and made Alan Moore really mad creating controversy from every side? Yeah, its importance as a whole was really overblown since everyone basically forgot all about it just a few months after its conclusion. And is not like Before Watchmen was really bad, it was just... passable. It was decently written and in some cases, wonderfully drawn but at the same, there was nothing memorable about it and it didn't really make neither the characters of world any more interesting. This is important to mention because Doomsday Clock is the complete opposite in terms of reception. Don't get me wrong, it was certainly hated too since it was teased at the beginning of the Rebirth initiative due that Watchmen is considered a sacred cow that shouldn't be touched (and I do agree with that mentality to a certain extent). Plus, this was handled by Geoff Johns of all people, a writer who is known for his entertaining but easy to digest work, he's pretty much a blockbuster creator and there's nothing wrong with that since he's good at what he does. The fact that he was also able to handle complex material was a surprise for pretty much everyone. Unlike Before Watchmen, Doomsday Clock is an actual sequel to the events of the original Watchmen series where, as the original implied, "nothing ever ends" and their world was once again at danger of war and Ozymandias feels forced to try to save his planet by looking around the Multiverse for Doctor Manhattan and this eventually leads him to the classic DC Universe. 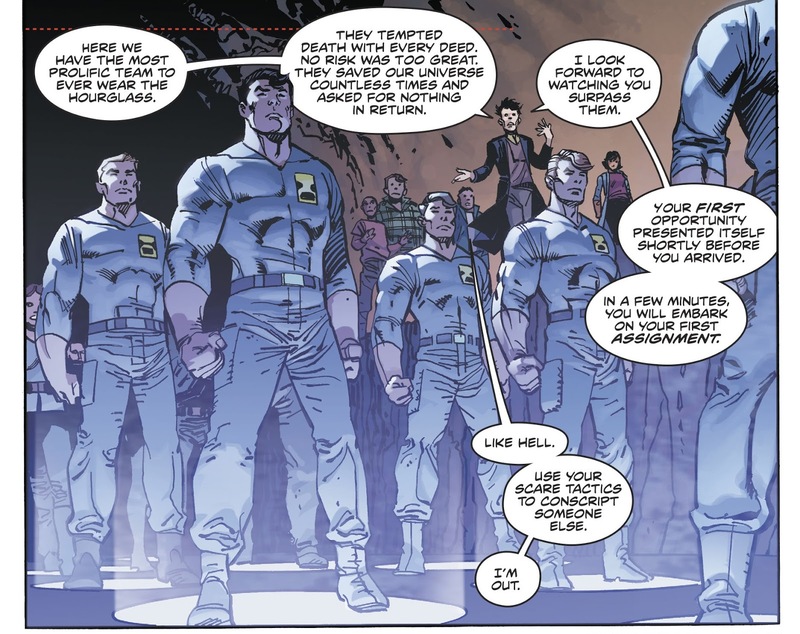 While the series was initially sold as a more conventional crossover between Watchmen and Superman, the former concepts ended-up being more prominent and I honestly think that worked for the better because that allowed Johns to experiment with a different kind of writing from his usual in which he emulates Moore's tone the best way he can, I can't say is perfect since nothing really is but he is truly close. The writer understands what made the Watchmen universe so different from the classic DCU. It was a reality where cynicism and despair were abundant, a world where the lines between good and evil were pretty blurry and their "heroes" were forced to commit actions that not even villains were willing to do. Johns revisits these characters and gives them an appropriate portrayal, perfectly showcasing Ozymandias and his Messiah Complex, and how he believes he's the only one who has the right plan for his planet, reuniting a few characters that follow the logic of the original story and touching its abundant classic themes. Even the new characters that Johns created, Mime and Marionette, seem like they could have existed in Moore's work which is nothing short of impressive. The best part is how all of these ideas clash with the rest of the DCU in a way that you can start seeing how they even influence it. The story becomes darker and darker with each chapter in which superheroes find themselves in terrible situations, the war between the U.S.A. and Russia could happen at any moment and an overall sense of distrust is growing among the people. The parallels with Watchmen are pretty clear and all of this works alongside a mystery concerning who is behind these actions. This is probably the most serious and realistic work that Johns has ever done, one that actually explores compelling concepts and even gives classic characters brand new interpretations, offering a sense of depth that at times is even shocking. Of course Gary Frank's art plays a huge factor here. He has always worked well alongside Johns and this is demonstrated by his ability to capture every scene of the script, especially the characters whose and expression and details make them really come to life. Powerful, intriguing and impressive, Doomsday Clock certainly deserves the number 1 spot because of how nobody thought it could be this good. And that my friends, is my Top Ten Best DC Comics of 2018 list. It has been a wild year that certainly brought the goods and I can't wait for what is going to happen in 2019 now. Let's all hope that everything is even better.